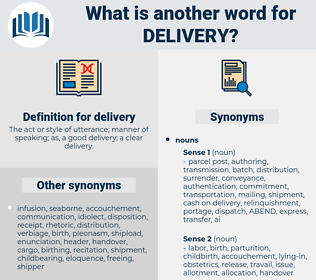 What is another word for delivery? deliverables, purposes, meals, modifications, directors, governors, gateways, Tests, partners, changes, Languages, remarks, Trustees, Delivering, amendments, events, units, deliver-to, distribution, distributions. Lectures, goods, rendering, Delivering, birthing, hand-over, transportation, Prestation, receipt, livery, disbursement, arrival, Transporting, obstetric, dedication, vector, Channelling, servicing, midwifery, notification, conveying, childbearing, parturition, decommissioning, operationalization, drop-off, maternity, distribution. fulfilled, Forwarded, facilitated, Offered, executed, Undertook, Proceeded, Performed, conferred. deals, follows, works, challenges, needs, rebates, calls, happens, becomes. imprisonment, retention, secrecy, quiet, capture, restraint, confinement, keeping, hold. This she handed to Katerina, whom the General had never seen, with instructions to take it to his office and hand it for delivery to some responsible person. Samuelson's delivery, his way of pleading were well known. deliver, day laborer, Day Labourer, deliverer.